There only four short weeks till the exhibition Tolkien: Maker of Middle-earth currently running at the Bodleian Library, Oxford closes (closing date 28th October). With free entry (pre-book a time slot) this opportunity to view items from the Tolkien Trust, Marquette University and the Bodleian Library's Tolkien Archive is well worth the visit. A chance to view this rarely displayed collection was thrill, made even more so in that Tolkien's Father Christmas Letters and the development of the story Roverandom, featured amongst the illustrations, drafts, sketch-books and other artefacts. Tolkien started writing these communications in 1920, starting with a note from ' .. Fr. Chr. ' to his son John (aged 3). Tolkien was commuting between Oxford and Leeds having been elected to the post of Reader at the University of Leeds. 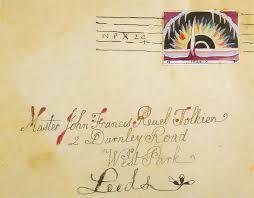 This tradition continued and Christmas 1924 'Master John Francis Reuel Tolkien' duly received his letter, to the family's new address in West Park, Leeds. With Tolkien's academic career seeing him return to Oxford and the greater works of The Hobbit, The Lord of the Rings and The Silmarillion establishing his talent as an artist and story-teller it was heartening to see this Leeds connection as part of that story. The Tolkien Society will be hosting a four day conference in Birmingham in 2019. Tolkien 2019 will mark the 50th anniversary of the Society and bring together fans, scholars and artists from far and wide. Be There!